Welcome to the Islandinfo website! 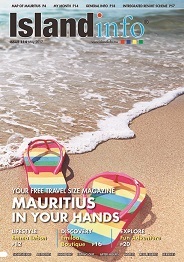 Islandinfo was launched in December 2007 and has quickly grown to become Mauritius's leading English language magazine aimed at both tourists and locals. It is a monthly magazine with a duplicate online version to make it as easily accessible as possible, so that whether you are visiting the island or living in another part of the world you can access Islandinfo and through its pages, be they glossy or digital, discover and plan your trip through the beautiful tropical paradise that is Mauritius. Inside, a broad range of topics are covered such as sight seeing, shopping, recreation, local services and real estate. Adverts provide contact details and opening times and there are interesting interviews with people of note. Finally, there is a handy little map for finding your way around to places of interest. We hope you enjoy the magazine and find it useful. Please feel free to contact us and there is a forum available as well as a testimonial page for any comments you wish to make.